I am so happy to have people express interest in following along on the 100 Day Stitch Meditation. I have already added a few more threads and fabrics to the box :). I look forward to seeing what you are making. Share your stitch meditations on Instagram and Facebook using: #stitchmeditation2019, #100daysofart, #slowstitchmovement or leave me a comment below. A couple of people who were thinking about participating were having difficulty with the idea of creating just for the sake of creating. They felt they needed a goal to work towards. Two textile artists: Lisa Call and Linda McLaughlin have engaged in daily art projects with parameters around making with end goals. They have participated in daily, weekly and 100 day challenges. Each artist has their own reason for starting and continuing their projects over the years. Lisa Call is a textile artist living in New Zealand. Her website is: Lisa Call Fine Art – Contemporary Textile Paintings. She began her first 100 Days Project shortly after moving to New Zealand from the United States in 2016. Lisa participated in this annual 100 Days Project which culminated in a Pop-Up, so she would set up her studio and begin creating. Her parameters for the project: create textile paintings that would finish at 6×6 inch (15×15 cm) and use monochromatic colours from her hand dyed fabrics. Lisa continued her 100 Days Project in 2017. This time her parameters were to make textile paintings that finished at 5×5 inches (13×13 cm) and explored mark making on fabric. Her palette was limited to black and white. She also knew that to keep herself motivated to finish this time, she needed to have a goal at the end of the 100 days. So, Lisa contacted the Tutere Gallery and spoke to the owner. The gallery owner, an artist herself, along with Lisa and four other artists committed to the 100 Day Project and to hold an exhibit at the end. 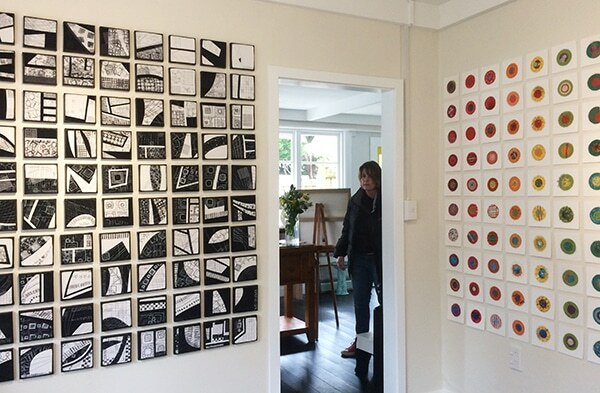 The photograph below shows Lisa’s artwork on display in the gallery along with the artwork of textile artist Sara Boland at the Tutere Gallery. Photograph Courtesy of Lisa Call. For her 2018 100 Days Project, Lisa continued her exploration of mark making using pencil, ink and charcoal on paper. Each piece was 5×5 inches (13×13 cm). She also considered finishing the drawings and making them available for sale. At Day 50 of the project, Lisa decided to not worry about selling the sketches and this gave her freedom from the pressure of creating for others. As well as participating in the project, Lisa was leading a group of over 50 artists from around the world in their own 100 Day practice. Each artist set their own parameters around the project and their progress was shared on Facebook. Lisa has written a blog post about her feelings and experience around 100 Day Projects. She found that making one piece of art every day was not realistic for her lifestyle. Lisa changed the parameters around creating in order to make it work for her, she says: “I will complete 100 textile paintings by the end of the 100 days – working on the project every day that I am home, which will be most days.” Now Lisa finds that the project has become a habit, where she consistently sketches, not everyday, but as a part of her art practice. Article: Joe from TextileArtist.org Could Sampling be your Creative Super Power? In the next post I discuss the daily and weekly projects of Linda McLaughlin. I hope reading about Lisa’s experiences with her 100 Days Projects will give you some ideas for your project. How are you feeling about the project? Are you enjoying just playing with colours and stitches to create something pleasing? Are you stressing about it being perfect? I encourage you to keep practicing – one stitch at a time.